Two of Philly's finest were spotted hanging out Tuesday night at the 76ers game. 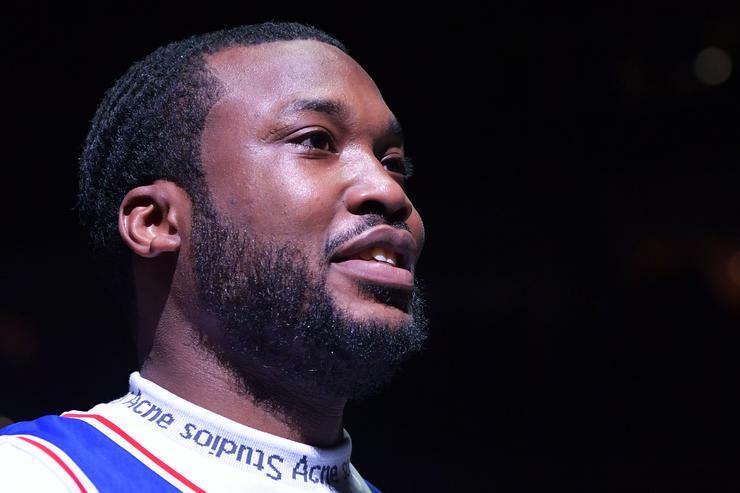 It's safe to say Meek Mill was the man of the hour day on Tuesday. After being released from prison on bail, the MMG rapper immediately hopped in a helicopter and flew his way to to Philadelphia to see his hometown 76ers take on the Miami Heat in Game 5 of the NBA Playoffs. While there, Meek rang the ceremonial bell before the game and even saw his favorite team run out to his “Dreams & Nightmares” intro as well, but that wasn't all. Following the game, Meek was spotted hanging out with fellow Philly rockstar Lil Uzi Vert. The two took a picture together along with Meek’s son who was also by his father’s side throughout the game. While the picture is great in itself, some people are having a field day with how small Uzi looks next to Meek. People are saying Meek looks like Uzi’s stepdad in the pic with his arm around him, while Uzi being his rebellious "son." Of course it’s just some innocent roasting, but pretty on point & hilarious if you ask me.